proudly served in the United StatesArmy as a field artillery surveyor. of twin boys, Zachary and Garrett, both seven years old. with design intent and specifications. 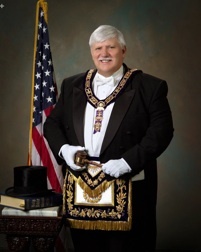 member of all York Rite bodies and completed that joining process in 2009.
honored as State Mason of the Year in 2007.
so good a man as our Grand Master Dean A. Barr.